Our most fearless Lucy's Love Bus supporters join forces each year to raise money for the world's bravest kids, and then leap 10,000 feet from a plane! 2017 was a huge success, with 34 skydivers raising $53,000! We had a small but mighty team in 2018 that raised over $25,000, so we're already refueling and prepping to take flight in 2019 to make it the best year yet! Participating in easy!!!! Just fill out the form below so we can save you a spot, and then make a fundraiser on Facebook or Crowdrise! If you raise at least $1200, Love Bus will reimburse you for your jump fee (up to $200)! You can participate wherever you are in the world, but if you want to jump with us, we're making a huge party out of it and we want YOU to join us Sunday September 8th at Skydive New England! Scroll down to fill out the registration form, and we will send you information on how to get started! *Please double check that we have the correct email address so we can follow up with you ASAP! Do you want to jump with our group at Skydive New England in Lebanon, ME on Sunday September 8th? No, I'll jump at a dropzone near me. I'm not sure yet, please send me more info! 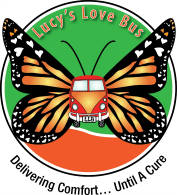 To have Lucy's Love Bus pay for your jump (up to $200), I acknowledge I must meet the fundraising minimum of $1200. If you jump at Skydive New England, Lucy's Love Bus will reimburse you $75 for your deposit needed to reserve your jump day/time, and pay for the rest of your jump. If you jump at another dropzone, Lucy's Love Bus will reimburse you up to $200 towards your jump, with a receipt copy from the dropzone. You must be 18 or over on the day of the jump to participate, and weigh less than 240lbs. By checking below, you acknowledge these 2 factors. *Please confirm these restrictions with your chosen dropzone if jumping somewhere other than Skydive New England as restrictions may vary.